Convention General Chairman Tom Chidsey welcomes AAPG geologists to Salt Lake City with an Olympic Torch. Salt Lake City was the site of the 2003 American Association of Petroleum Geologists (AAPG) Annual Convention this past May. The AAPG is the largest geological society in the world with over 32,000 members. Overcoming a heightened terrorism level, fears of SARS, war jitters, and a shaky economy, nearly 5,000 geologists, including representatives from 48 states and 77 countries, attended the convention to exchange the latest petroleum research results, learn about state-of-the-art technology, network, and make drilling deals. The Utah Geological Survey (UGS) played a major role in the success of this event. Utah was selected by AAPG for the convention because it has consistently remained in the top 15 oil- and gasproducing states in the U.S and, most importantly, the rocks so well exposed in Utah make for one of the best natural laboratories in the world for petroleum geologists. 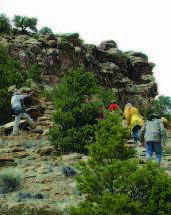 The convention included 17 field trips with over 350 geologists examining rocks all over Utah. Many of the field trip leaders were UGS geologists showing the attendees (some braving heavy rain and snow!) areas where the Survey has conducted mapping and petroleum projects such as the Uinta Basin, Ferron Sandstone, and several national parks; Mark Milligan (UGS) served as the field trip chairman. Over 800 technical presentations were given at the convention – the main purpose of the meeting. Several UGS geologists presented results of Survey petroleum projects (Paradox Basin horizontal drilling study, carbon dioxide sequestration, and coalbed methane) and served as session chairs. The teacher program was also a big success and was co-sponsored by the UGS; Sandy Eldredge (UGS) served as the chairperson. Eighty-five Utah teachers attended field trips and a special workshop called “More Rocks in Your Head“ (held at the Department of Natural Resources) where they received accreditation. The UGS also sponsored a very well attended short course at the Utah Core Research Center where the drilling potential of ancient reef-like mounds in southeastern Utah was presented through examination of oilwell cores (see article in the previous Survey Notes). Finally, the UGS prepared a wonderful display of historical photographs from the early days of oil and gas exploration in Utah. In summary, geologists from around the world left Salt Lake City knowing that Utah is a great host, whether you are an Olympic athlete or someone who searches for energy, and that Utah is a great place to study geology and conduct an energy search.